Aquatic natural compounds possess antimicrobial activity against various human pathogenic microorganisms. Therefore, by considering the importance of those products, the purpose of this study is to evaluate the antibacterial effects of different prawn shell extractions on common pathogenic bacteria. Prawns were collected in summer 2014 from Anzali wetlands in southern coast of Caspian Sea and transferred to tanks containing sea water with aerator in the biology laboratory (Lahijan Branch, Islamic Azad University). To complete anesthesia, temperature was set to zero degree. Afterward, the shells were removed from whole bodies and washed with distilled water. The removed shells were freeze-dried and grind to dried powder. To prepare different extractions, 5 g of prawn powder dissolved in 150 ml of different solvents (75% of hydroalcoholic, acetone, and methanol) and were incubated for 48 h in a dark place. Then, they were filtered through filter paper., The solvents were evaporated by the lyophilizator and the obtained powders were weighed. Next, the consideration dose (2 mg/ml) of each extract was prepared using saline to resulting suspension. Staphylococcus aureus (ATCC 25923), Bacillus subtilis (ATCC 465), Escherichia More Details coli (ATCC 25922), Klebsiella pneumoniae (ATCC 10031), and Vibrio cholerae (ATCC 14035) provided by the Iranian Research Organization for Science and Technology were used as the bacterial tested organisms. Then, bacterial suspensions based on standard 0.5 McFarland (1.5 × 108 CFU/ml) were prepared. In vitro antibacterial activities of different extracts of prawn shells were evaluated against five microbial stains using the well-agar diffusion method., Stock cultures were added to Muller-Hinton broth on the day before experiment and incubated for 24 h at 37°C. Different cultures of pathogenic bacteria were swabbed on the Muller-Hinton agar plates. Further, the filter paper discs (6 mm diameter) were impregnated with exact amounts of each extract. Standard antibiotic disks Gentamicin 10 and Erythromycin (Iran Daru Company) were used as the positive control. The plates were incubated at 37°C for 24 h. Afterward, the inhibition zones formed on the media were measured. The positive antimicrobial activities were recorded based on the growth inhibition zone. All inhibition assays and controls were carried out in triplicate. All data were expressed as mean ± standard deviation (SD), and statistical analyses were performed with the SPSS 17 software package (SPSS Inc., Chicago, USA). The significance of the results was tested by an analysis of variance and Duncan's multiple range test. The significance of differences was defined at P < 0.05. The antibacterial sensitivity results of three different extracts of prawn shells against the five different bacterial strains are shown in [Figure 1],[Figure 2],[Figure 3],[Figure 4],[Figure 5]. The greatest action among different extracts was observed in V. cholerae and S. aureus. 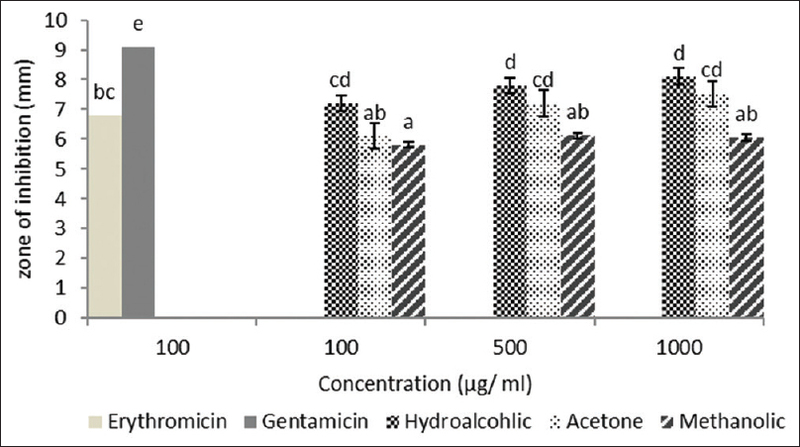 The hydroalcoholic extract was shown for the highest antibacterial activity against S. aureus than the other extracts [Figure 1], and all the extracts revealed significant action more than erythromycin (P < 0.05). The maximum zone of inhibition (8.11 ± 0.21 mm) was exhibited against Ecoli in 1000 μg of the hydroalcoholic extract [Figure 2]. There was no antibacterial effect in the methanolic extract. There was a significant difference between different extracts against E. coli. In K. pneumoniae, the greatest antibacterial effect appeared in hydroalcoholic and acetone extracts with 100 mg/ml of concentration. The methanolic extract did not show any antibacterial effect. 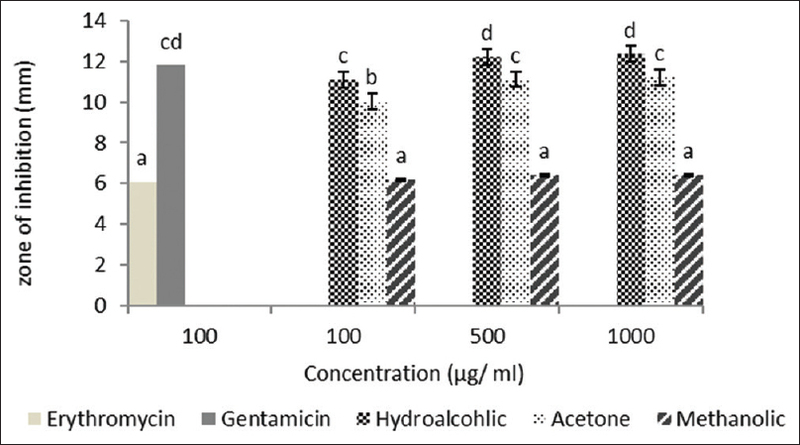 The effects of hydroalcoholic and acetone extracts against K. pneumoniae were less than those of the gentamicin antibiotic and more than erythromycin [Figure 3]. 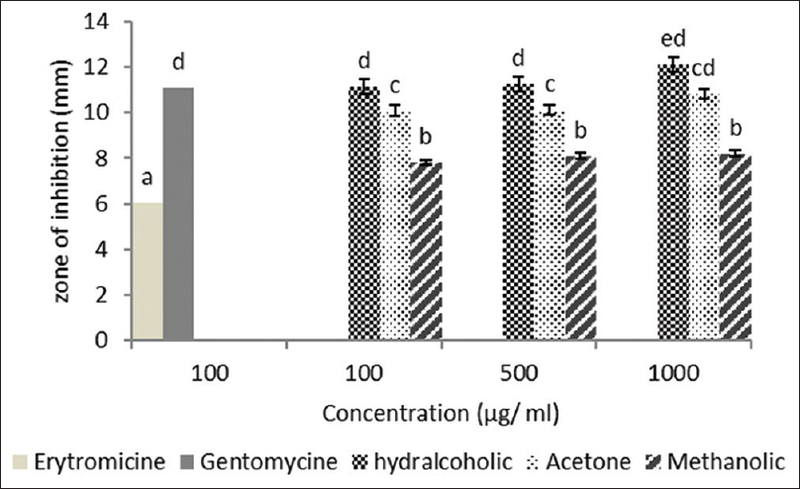 The highest antibacterial effect in B. subtilis was related to hydroalcoholic and acetone extracts having zone of inhibition 11.25 ± 0.18 mm (at dose 500) and 12.12 ± 0.32 mm (at dose 1000) in hydroalcoholic and acetone, respectively [Figure 4]. Different extracts significantly showed various antibacterial effects against B. subtilis (P < 0.05). 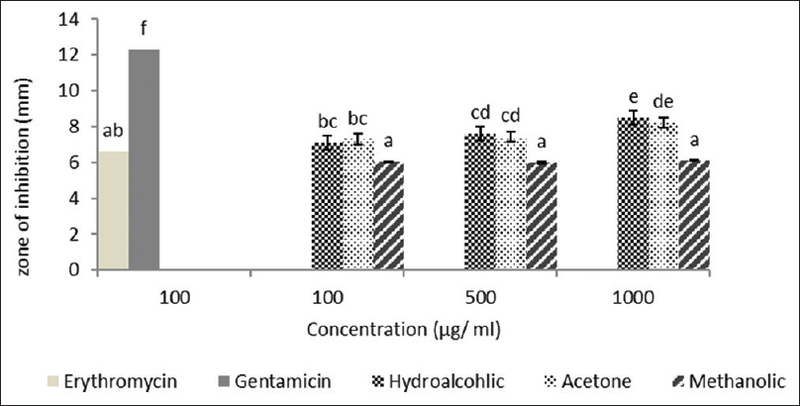 The significant activity of the hydroalcoholic extract was observed against V. cholerae having zone of inhibition 12.35 ± 0.27 mm at a dose of 1000 mg/ml, while the metanolic extract did not show any antibacterial effect [Figure 5]. Different extracts exhibit significant differences against V. cholerae (P < 0.05). The results of the present study indicated that prawn shell extracts are more active against Gram-positive bacteria than Gram-negative bacteria. The type of solvent can be involved in antibacterial effects in such a way that the hydroalcoholic extract of prawn shells is the most active extract against Gram-positive bacteria and even Gram-negative bacteria. The bactericidal of prawn shell extracts against pathogenic bacteria can be considered as an alternative therapeutic agent. We are indebted to the research Vice Chancellor of Islamic Azad University Lahijan Branch, for supporting this research. Chellaram C, Gnanambal KM, Edward JK. Antibacterial activity of the winged oyster Pteria chinensis (Pterioida: Pteridae). Indian J Mar Sci 2004;33:369-72. Proksch P, Edrada RA, Ebel R. Drugs from the seas-Current status and microbiological implications. Appl Microbiol Biotechnol 2002;59:125-34. Takahashia T, Imaia M, Suzukia I, Sawai J. Growth inhibitory effect on bacteria of chitosan membranes regulated by the deacetylation degree. Biochem Eng J 2008;40:485-91. Haug T, Kjuul AK, Styrvold OB, Sandsdalen E, Olsen ØM, Stensvåg K. Antibacterial activity in Strongylocentrotus droebachiensis (Echinoidea), Cucumaria frondosa (Holothuroidea), and Asterias rubens (Asteroidea). J Invertebr Pathol 2002;81:94-102. Shahidi F, Synwieki J. Isolation and characterization of nutrients and value added products from snow crab (Chionoecetes opilio) and shrimp (Pandalus borealis) processing discards. J Agric Food Chem 1991;39:1532-72. Yilmaz E. Chitosan: A versatile biomaterial. Adv Exp Med Biol 2004;553:59-68. Brine P, Sandford A, ZikakisJP, editors. Advnces in chitin and chitosan. Proceedings from the Fifth International Conference on Chitin and Chitosan. London: Elsevier; 1992. p. 472-8. Li B, Wang X, Chen R, Huangfu V, Xie G. Antibacterial activity of chitosan solution against Xanthomonas pathogenic bacteria isolated from Euphorbia pulcherrima. Carbohydr Polym 2008;72:287-92. Jeon YJ, Park PJ, Kim SK. Antimicrobial effect of chito oligosaccharides produced by bioreactor. Carbohydr Polym 2001;44:71-6. Kong M, Chen XG, Xue YP, Liu CS, Yu LG, Ji QX, et al. Preparation and antibacterial activity of chitosan microspheres in a solid dispersing system. Front Mater Sci China 2008;2:214-20. Huang X, Huang X, Jiang XH, Hu FQ, Du YZ, Zhu QF, et al. In vitro antitumour activity of stearic acid-g-chitosan oligosaccharide polymeric micelles loading podophyllotoxin. J Microencapsul 2012;29:1-8. Maeda Y, Kimura Y. Antitumor effects of various low-molecular-weight chitosans are due to increased natural killer activity of intestinal intraepithelial lymphocytes in sarcoma 180-bearing mice. J Nutr 2004;134:945-50. Park BK, Kim MM. Applications of chitin and its derivatives in biological medicine. Int J Mol Sci 2010;11:5152-64. Younes I, Rinaudo M. Chitin and chitosan preparation from marine sources. Structure, properties and applications. Mar Drugs 2015;13:1133-74. Gokilavani S, Vijayabharathi V, Parthasarathy R. Physico-chemical characteristics and antibacterial activity of chitosan extracted from shell of crab Paratelphusa hydrodromous. Asian J Res Pharma Sci 2014;4:125-8. Nisha G. Antibacterial effect of crab shell extract against human pathogenic bacteria. Int J Sci Eng Tech Res 2015;5790-1. Lennette EH. Manual of Clinical Microbiology. 4th ed. Washington, DC: American Association for Microbiology; 1985. Zhong Z, Xing R, Liu S, Wang L, Cai S, Li P. Synthesis of acyl thiourea derivatives of chitosan and their antimicrobial activities in vitro. Carbohydr Res 2008;343:566-70. Sagoo SK, Board R, Roller S. Chitosan potentiates the antimicrobial action of sodium benzoate on spoilage yeasts. Lett Appl Microbiol 2002;34:168-72. Liu H, Du Y, Yang J, Zhu H. Structural characterization and antimicrobial activity of chitosan/betaine derivative complex. Carbohydr Polym 2004;55:291-7. Rabea EI, Badawy ME, Stevens CV, Smagghe G, Steurbaut V. Chitosan as antimicrobial agent: Applications and mode of action. Biomacromolecules 2003;4:1457-65. Wei D, Sun W, Qian W, Ye Y, Ma X. The synthesis of chitosan-based silver nanoparticles and their antibacterial activity. Carbohydr Res 2009;344:2375-82. Feng Y, Xia W. Preparation, characterization and antibacterial activity of water-soluble O-fumaryl-chitosan. Carbohydr Polym 2011;83:1169-73. Vilar Junior JC, Ribeaux DR, Alves da Silva CA, De Campos-Takaki GM. Physicochemical and antibacterial properties of chitosan extracted from waste shrimp shells. Int J Microbiol 2016;2016:1-7. Article ID 5127515. Helander IM, Wright AV, Mattila-Sandholm TM. Potential of lactic acid bacteria and novel antimicrobials against gram-negative bacteria. Trends Food Sci Technol 1997;8:146-50. No HK, Park NY, Lee SH, Meyers SP. Antibacterial activity of chitosans and chitosan oligomers with different molecular weights. Int J Food Microbiol 2002;74:65-72.